What was supposed to be a normal trip to the grocery store, turned out to be something much more. Earlier this month, Matt White, 30, was approached by a 16-year-old boy from West Memphis, Tennessee, as he was shopping for groceries at Kroger. The teen, identified as Chauncy, offered to carry White’s groceries to his car in exchange for a pack of glazed doughnuts. White said in his heart he screamed a loud “yes!,” “but to him I just chuckled and said, ‘yeah dude, we’ll get you some donuts,'” White wrote on his Facebook page. Based on these observations, White decided to buy Chauncy groceries instead. “We got cereal and chips and frozen veggies, pizzas, Cheetos, melons and pasta, peanut butter, milk, soap, tooth brushes, just a little bit of everything,” White wrote. As the two got familiar with one another, White learned many things about Chauncy. “… he told me how he makes straight A’s in school and is trying to get a job to help his mom pay rent. This kid was amazing. Chauncy kept calling himself poor, but he told me that one day he was gonna be wealthy and own his own businesses so that he could help other people in his neighborhood and buy them groceries like me. I was in awe,” White wrote. Once White arrived at Chauncy’s home to bring up the groceries, he discovered that both Chauncy and his mother were sleeping on the floor. Their refrigerator was also empty. White then took to Facebook on June 10, sharing what had transpired that day. Many people on social media were moved by his kindness and offered to help Chauncy and his mom in any way they could. “I want to help. You are truly amazing as is this young man,” wrote a Facebook commenter. “I work at a place where we have a thrift store I need his address if possible,” wrote another. One woman on social media, Maryan Stevenson, said she knew Chauncy and his mother. 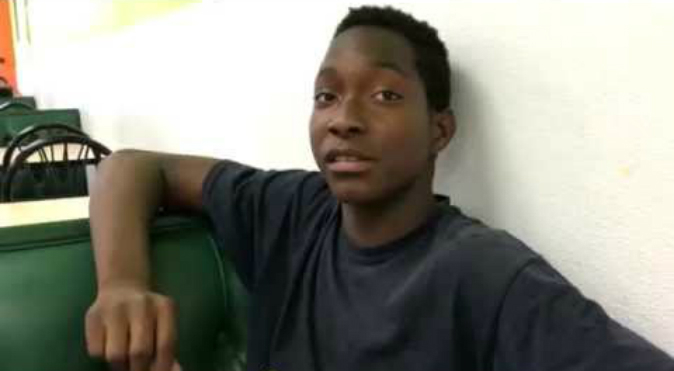 “OMG I’ve know Chauncy & his mom for years…he is such a respectable & deserving person. He will succeed in life!!! Thank you so much for helping them!!! You’re an Angel!” she wrote on White’s Facebook post. Below is a video—made by White—of Chauncy asking for clothes and a push lawnmower so that he could cut lawns to get some sort of income. On June 13, White created a GoFundMe page to help raise a few hundred dollars for Chauncy. As of June 23, White has raised $27,103. “I didn’t think it could happen, but it did. I’m 30 years old and I have a new hero,” he wrote on the fundraising page.